Could this be the Droid Ultra? The forthcoming Moto X phone may kickstart the new Google-owned era for the company, but Motorola is still planning to keep its existing brands alive, judging by leaks this weekend. Just yesterday we published a purported leaked press image of the Motorola Droid Maxx, scheduled to arrive later this year. 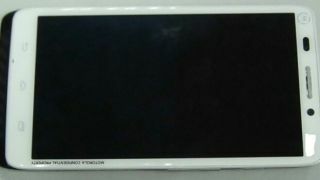 On Sunday, a photo of a second device emerged, courtesy of the XDA Developers' forum, which may showcase the Motorola Droid Ultra. Beyond the snap, there's no further information on specs or size. All that we can tell is that the bezel is quite thin and the volume rocker and power button sits on the size of the handset. Last week, the company sort-of announced the Droid Ultra on its website, advising interested parties to 'think thin' but didn't reveal anything else in the process. Of course, the device could just be a leaked prototype and nothing like the real thing, but we'll keep our noses to the ground on this one? Will the Moto X and the new era for Motorola arrive as soon as July 11?